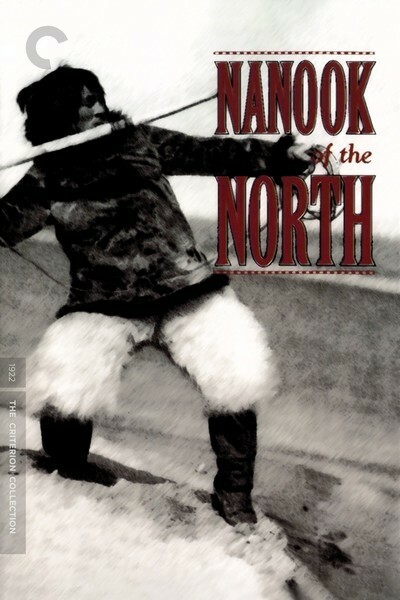 There is an astonishing sequence in Robert J. Flaherty's "Nanook of the North" (1922) in which his hero, the Inuit hunter Nanook, hunts a seal. Flaherty shows the most exciting passage in one unbroken shot. Nanook knows that seals must breathe every 20 minutes, and keep an air hole open for themselves in the ice of the Arctic winter. He finds such a hole, barely big enough to be seen and is poised motionless above it with his harpoon until a seal rises to breathe. Then he strikes and holds onto the line as the seal plunges to escape. There is a desperate tug of war. Nanook hauls the line 10 or 12 feet out of the hole, and then is dragged back, sliding across the ice, and pulls again, and again. We can't see, but he must have the line tied to his body -- to lose would be to drown. He desperately signals for his fellow hunters to help him, and we see them running across the ice with their dogs as he struggles to hold on. They arrive at last, and three or four of them pull on the line. The seal prevails. Nanook uses his knife to enlarge the hole, and the seal at last is revealed and killed. The hunters immediately strip it of its blubber and dine on its raw flesh. There has been some discussion among critics of a possible interruption in the filming; we never see the seal actually being pulled up to the surface. Was the quarry shot with a gun that Flaherty did not want to show, because that would affect the purity of his images of man against nature? Such questions are part of a decades-old debate about the methods of a man who has been called the father of the documentary, whose films are masterpieces, and yet whose realities were admittedly assisted. We know, because Flaherty was frank about it, that he recruited the cast for his film. Nanook was chosen because he was the most famed of the hunters in the district, but the two women playing his wives were not his wives and the children were not his children. Flaherty's first footage was of a walrus hunt, and he revealed that Nanook and his fellow hunters performed the hunt for the camera. "Nanook" is notcinema verite.And yet in a sense it is: The movie is an authentic documentary showing the creation of itself. What happens on the screen is real, no matter what happened behind it. Nanook really has a seal on the other end of that line. The movie shows Nanook during a few weeks in the life of his family. Countless details fill in a way of life that was already dying. We see the hunters creeping inch by inch upon a herd of slumbering walruses, and then Nanook springing up and harpooning one, and then a fierce struggle in which the mate of the walrus joins the battle. Such scenes simplify Inuit life to its most basic reality: In this land the only food comes from other animals, which must be hunted and killed. Everything the family uses -- its food, fuel, clothing and tools -- comes in some way from those animals, except for the knives and perhaps harpoon points, which they obtain at a trading post. They are a luxury; before there were trading posts, there were already Inuit. One of the film's most fascinating scenes shows the construction of an igloo. Nanook and his friends carve big blocks of snow and stack them in a circle, carving new ones from the floor so that it sinks as the walls rise and curve inward to form a dome. Then he finds sheets of ice, cuts holes in the igloo walls, and inserts the ice to make windows. There is another igloo, a smaller one, for the dogs. And inside the big igloo, the tiniest igloo of all, for puppies, which the big dogs would quickly eat. Nanook has a small son named Allee, and a baby, Rainbow, 4 months old; they travel inside the hoods of their mothers. There are scenes of unstudied grace and love as his wives, Nyla and Cunayou, care for the children, the children play with the puppies, and the whole family strips to crawl under their furs, which act as blankets for the night. There are also moments of hazard, as they are nearly lost in a sudden snowstorm, and times of great hunger and desperation. These are suggested in the film, but became real in the aftermath: Nanook, lost in a storm, died of starvation two years after Flaherty filmed him. "I lost no time in developing and printing the film. That walrus fight was the first film these Eskimo had ever seen and, in the language of the trade, it was a 'knock-out.' The audience -- they thronged the post kitchen to the point of suffocation -- completely forgot the picture. To them the walrus was real and living. The women and children in their high shrill voices joined with the men in shouting admonitions, warnings and advice to Nanook and his crew as the picture unfolded on the screen. The fame of that picture spread through all the country. ... After this it did not take my Eskimo long to see the practical side of films and ... from that time on, they were all with me." The film is not technically sophisticated; how could it be, with one camera, no lights, freezing cold, and everyone equally at the mercy of nature? But it has an authenticity that prevails over any complaints that some of the sequences were staged. If you stage a walrus hunt, it still involves hunting a walrus, and the walrus hasn't seen the script. What shines through is the humanity and optimism of the Inuit. One of the film's titles describes them as "happy-go-lucky," and although this seems almost cruel, given the harsh terms of their survival, they do indeed seem absorbed by their lives and content in them, which is more than many of us can say. Flaherty went on to make more sophisticated films, notably "Tabu" (1931), an uneasy collaboration with the great German filmmaker F.W. Murnau, who was more interested in story and style than documentation; "Man of Aran" (1934), about the hard lives of the Aran Islanders off the coast of Ireland; "Elephant Boy" (1937), starring Sabu in a fiction based on a Kipling story, and "Louisiana Story" (1948), in which a young bayou boy watches as an oil rig invades his unspoiled domain. The later films are smoother and more conventionally beautiful, but "Nanook" stands alone in its stark regard for the courage and ingenuity of its heroes. Nanook is one of the most vital and unforgettable human beings ever recorded on film. Note: The movie is available in a Criterion DVD edition, restored by David Shepard with a score by Timothy Brock. At the Toronto screening, the composer Gabriel Thibaudeau, from Quebec, led nine musicians (four flute players, a soprano, a bass, a drummer, and the Inuit throat-singers Akinisie Sivuaraapik and Caroline Novalinga) in the premiere of his score that celebrates the beauty of the land and, during scenes of crisis, expresses urgency, surprise, fear and triumph in throat-sounds both musical and elemental. Now that do-it-yourself commentary tracks can be downloaded from the Web and played with DVDs, I wonder if this performance could be made available the same way -- or offered as an alternative track on the next DVD edition.